I heard Kendrick Lamar’s first single from his new album, “Swimming Pools (Drank),” shortly after seeing him perform in Chicago this summer. When I first heard it, I was concerned with what it meant in terms of the direction of his (technically speaking) second studio album, good kid, m.A.A.d city. The song is noticeably produced with the intention of being played in the club, with thick bass and a catchy hook. But I was surprised a few months later when the album was released and Lamar was able to weave the hit into the narrative present throughout his entire album. Suddenly a club banger about pouring liquor and taking shots turned into a story of peer pressure and alcohol abuse. 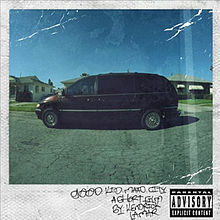 The narrative present on good kid, m.A.A.d city begins somewhere in Lamar’s jun ior year of high school in Compton. This album journeys through themes of peer pressure and gang violence that Lamar has experienced himself growing up in one of the most infamous cities in the United States. A number of these songs deal with Lamar’s personal experience participating in these acts of violence, while others reflect on how this has affected him as a person and those he has grown up around. The overall narrative throughout the album is supported by skits at the end of a number of the songs, ranging from dialogue between his friends and between his parents. Lamar also portrays a number of characters throughout good kid, rapping from the perspectives of other people as well as adjusting his delivery to fit the themes found in his songs. From the way he switches to rapping as his own conscience in “Swimming Pools (Drank)” to adjusting his vocal tonality to match that of a crazed, intimidated ‘good kid’ among a flurry of gang violence in “m.A.A.d City,” Lamar adds a theatrical element to his album. “Sing About Me, I’m Dying of Thirst” is a 12-minute swap of perspectives, where Lamar takes on the character of three different people, rapping about how a life witnessed to gang violence has affected their lives and even how Lamar’s success as a rapper has impacted them. Aside from Lamar’s strengths on the album, he also brings in a powerhouse of other rappers to accompany him throughout good kid like Drake and Dr. Dre. But despite the prowess of these other rappers present on the album, Lamar’s spotlight is never redirected. The roles of these other rappers on the album are modest, and the production on these songs (“Poetic Justice” and “Compton”) is built with the featured rappers serving as support for Lamar’s foundation, rather than the rooftop. At the end of the album we find two very different songs with Lamar rapping very differently on each one. “Real” is an intimate, emotional seven-minute track that acts as Lamar’s revelation on the album, rapping about things of real importance and loving those things. But before he ends each verse, he reminds himself that love has no value unless you have self-respect: “I love what the both of you have to offer / In fact, I love it so much I don’t love anything else / But what’s love got to do with it when I don’t love myself?” This intimacy is found on the final track “Compton” as well, but in a much different way. “Compton” has Lamar and Dr. Dre trading verses on the pride they both find in their city, despite their struggle to rise from the gang violence they witnessed and even participated in throughout their upbringing. While “Real” serves as the emotive end of the narrative aspect of the album, “Compton” serves as Lamar and Dr. Dre’s victory lap. These two different tracks and the two different Kendrick Lamars we hear on both of them is a testament to his versatility and talent as a rapper. His ability as a storyteller on good kid goes unmatched by any other hip-hop album in recent memory, and the creative ways he finds to display his social awareness throughout his music has brightened the dim future of hip-hop as a genre. Pingback: Hip-Hop: A genre of no pulse or a genre of vibrant subcultures?